Hirzel, D. R., Steenwerth, K., Parikh, S. J., and Oberholster, A. (2017). Impact of winery wastewater irrigation on soil, grape and wine composition. Agricultural Water Management: 178-189. DOI: https://www-sciencedirect-com.uri.idm.oclc.org/science/article/pii/S037837741630405X. Concerns about drought and shortages of clean water are galvanizing wineries to adopt a more sustainable approach to irrigating their vineyards. One method of current interest is the recovery and reuse of the wastewater that wineries produce. The production of 1 gallon of wine produces approximately 7 gallons of wastewater, meaning that large-scale wineries would have plenty of wastewater available for their irrigation purposes. A major obstacle to wastewater reuse that remains, however, is understanding how the waste products in the water could impact the vineyards and ultimately the wine that is produced. Two main processes contribute to winery wastewater: processing the grapes to be made into wine and cleaning for sanitation purposes. Wastewater components include grape solids and juices, which serve as the primary sources of potassium cations (K+) in the wastewater, and cleaning chemicals, which deposit sodium cations (Na+) into the wastewater. Cations are microscopic particles that possess a positive electrical charge. Winery wastewater is also typically high in organic matter and sugars from the grapes being processed. Although the materials found in winery wastewater are not necessarily harmful to all aspects of the environment, they can adversely impact the soil. For example, soil is negatively-charged, meaning that it is capable of holding onto positively charged cations (just like with magnets, opposite charges in soil attract). The cations in winery wastewater are likely to displace other cations that are already present in and necessary for the soil. When the soil loses its essential cations, its structure can become disturbed and destabilized. Disturbed soil structure may inhibit water and oxygen infiltration in the soil, which can impede the growth of grape vine roots. Cations can also be toxic to vines at high levels and may lead to leaf losses. Furthermore, studies have shown that the cations in wastewater can negatively impact the quality of the grapes and wines produced. 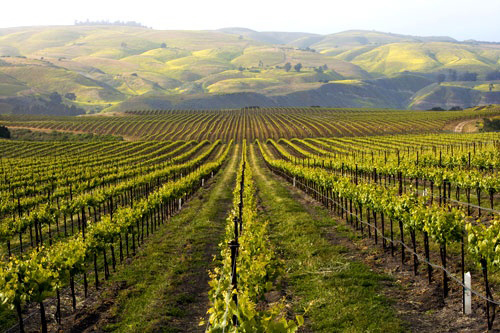 A recent study investigated the implications of irrigating with recovered wastewater compared to conventional irrigation methods at two large-scale wineries in Northern California. The two sites had slightly different soil characteristics; Site A was built on fairly slow-draining soils, while Site B was built on better-drained soils. Site A grows Vitis vinifera cv. Cabernet Sauvignon grapes and had only been treated with wastewater for 3 years, while Site B grows Vitis vinifera cv. Sauvignon blanc grapes and had been treated with wastewater for 21 years. Both sites also treated a portion of their vines with well water (conventional irrigation methods). Researchers investigated parameters of the irrigation water, soil, vine leaves, grapes, and wine from the vineyards’ wastewater-treated and well water-treated portions and analyzed the differences between the two treatments. Wastewater irrigation – a good approach? After all their analyses, researchers found that irrigating the vineyards with wastewater had very little impact on the winemaking process. Soil, vines, and grapes exhibited minor cation accumulation, but the cation levels were far below toxicity thresholds. Sensory analyses of the wines produced at each site revealed no differences between the wines produced via wastewater irrigation and those produced via conventional well water irrigation. This study suggests that utilizing wastewater in winery irrigation operations may serve as an excellent and sustainable method to incorporate into production. As climate change and growing populations cause resources to become limited, finding a purpose for resources that would normally be disposed of sets a positive precedent for society. ← Cancer Particles in the Kitchen? I’m a PhD student in the Laboratory of Soil Ecology and Microbiology at the University of Rhode Island. My research focuses on nitrogen removal in advanced onsite wastewater treatment systems in Charlestown, Rhode Island. Prior to this program, I earned my MS studying soils in vernal pool wetlands. My free time is usually spent reading, gaming, or practicing the ukulele!